Here we are again boy and girls, yet another game being given a touch-up and being sold to a new set of gamers who missed a game first time around. Going into replaying and re-reviewing Deadlight with this Director's Cut, I tried my best to try and remember if I enjoyed the game first time around on my 360 all the way back in 2012. Being old and trying to remember things is way harder these days though, so my mind is sort of telling me I did, but also with a hint of "I'm joking you old fool, you only thought it was only alright" coming through when thinking back. There is a plus side to this whole being old though, as because of it Deadlight felt like a new game to me. Not remembering any key moments meant playing Deadlight a second time around wasn't full of moments of me going "oooooooohhhhh, I remember what happens next" and made the experience a much better one because of it. The game is set in 1986 Seattle, with you playing the role of Randall Wayne, your standard family man with a rough voice who is seemingly not bothered about the thousands of undead banging down their door wanting to munch on his face. The game kicks off with him shooting one of the people in the group he is now part of, but not for fun, more because the silly women went outside and got bitten by one of those undead fools that now litter the streets and buildings of Seattle. From there he goes off on himself after telling the others to make it to the safe point while he goes out to try and find his family. As per the norm, I'll let you enjoy the rest of the game for yourself, but I will say the undead are not the only thing old Randall has to try and look out for to stay alive and complete his quest. 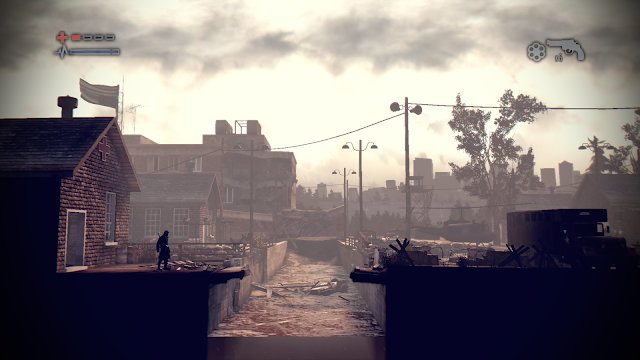 The game is very much a story-driven experience mixed with a puzzle game that has small moments of combat. You can try your best to not come into contact with the undead baying for your blood, but there will be times when you have to whip out your pistol or shotgun and lay waste to them. I'd say 50% of the game sees you solving simple puzzles on how to either escape a room or get to a certain area, with the other 50% being cartoon strip like cut-scenes and voiceovers bringing the story, and the rest being moments of you whipping out your pistol, shotgun, axe, or catapult out to do something with them, be it bring death or unlock a padlock to move on. The story itself is very short, with the Xbox game hub saying I've clocked up 4 hours game time, and the game itself saying it took me 2 hours and 30 minutes to finish the game with a 75% completion rate. So I guess you need to bear that in mind now the game has dropped the cheap pre-order price of £8.00 for those who owned the original, with the game now costing £15.99 on the Xbox store no matter what. The biggest downside for me in the whole game wasn't how short it was, but more how dated the control system felt. 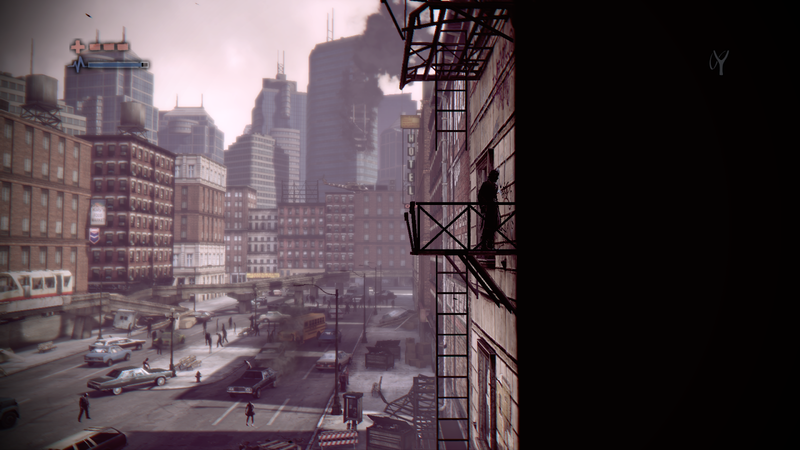 Deadlight is a game that needs quick reflexes, be that a far jump onto a ledge, or trying to jump over a pit full of spikes or outrun a falling ceiling. With my short time with the game, I fell to numerous deaths that were mainly down to a run and jump animation that seems to decide on pot luck if it wants to kill you or not. Pressing the jump button at times saw a good second delay on the action from pressing it to the jump happening, which in turn made me second guess when the right time to press the button was. Because of that I would under jump such pitfalls trying to compensate for this random delay that could strike at any time, only for the game to decide to jump when I actually pressed it and screw me over that way. It's not that it ruins the game completely but more an annoyance that will stop me even trying to tackle one of the modes I mention below. Beating the story above is not the end of it all, as the game tries to throw in some replay value in a number of ways. Not only can you dip back into the three chapters to hunt down and collect some of the hidden treats like diary pages, hidden secrets, and also the 3 hidden playable (yet utter rubbish) handheld games. Beating the game also unlocks Nightmare mode, a mode where you have one life and no save points at all, so getting from start to finish will be somewhat of a challenge. Adding in the jump delay I spoke about earlier I tried this game mode once, I lasted 5 minutes and never returned. If you have more patience than me though then this will be a mode and achievement that will add even more time onto the game clock. 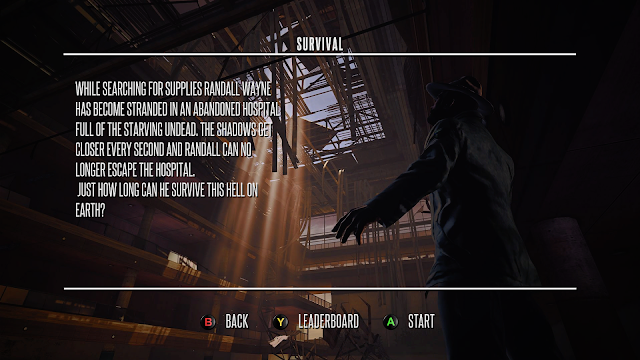 On top of those, you also have a brand new survival mode to try out, which I didn't find to be anything special being honest with you all. Stuck in a hospital with limited supplies, your goal is to basically stay alive as long as you can. The mode doesn't really have anything that makes you want to stick it back on after giving it the once over. Very much a look at and forget all about it 10 minutes later experience. Overall: Aside the few faults mentioned above, Deadlight was an enjoyable game to go and play through again. Yes it's short, but my time with the story side of the game aside the jump delay it was an enjoyable one. Does that make the game worth buying for £15.99 however? No it's doesn't, so I would say shop around for a good price or wait for a price drop to happen, as away from the story and collectibles it doesn't really offer much else.